5. Plan for the unexpected. 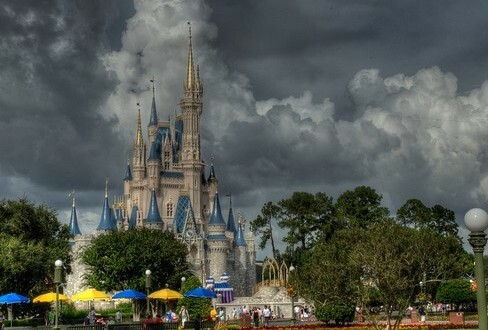 While Disney World is undeniably the most magical place on earth, there are still things that happen that can threaten the magic in your day—unless you’re prepared. It rains frequently in central Florida, especially in the spring and summer months. Some of those rainstorms include that pesky lightning, and while many things remain in operation in the rain, the presence of lightning in the area can pose a different scenario altogether. When there’s lightning in the area, there’s the chance that the monorail will be temporarily unavailable. Even with no lightning, rainstorms can cause Disney World buses to be somewhat delayed (and that’s good because it means that the drivers are taking precautions in the rain and that safety is their number one priority). And when you’re attempting to hop parks, any of these scenarios can delay you in leaving one park and arriving at another. Start your day in the parks knowing that rain can pop up at any time. Allow yourself enough time to leave one theme park and travel to another. Pushing the envelope when it comes to the clock won’t behoove you in any way at Disney World—it’s just too massive. Be prepared for the possibility of delays when you’re park hopping—sometimes because of the weather, and other times because of scheduled maintenance of the monorail trains or traffic that might affect the Disney buses.